It's time again for my quarterly review of global smartphone market share trends. Global data for Q2 2013 is sourced from Gartner, while country-wise data is sourced from Kantar's monthly reports. Overall, Android has consolidated its position as the leading smartphone platform, while the iPhone continued to lose ground heading into launch season. In contrast, Windows Phone's market share patterns are interesting as they aren't really consistent across similar regions. 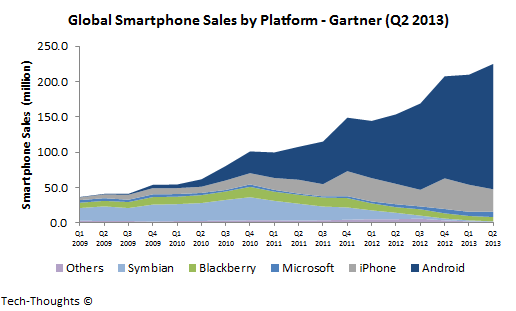 The chart above represents Gartner's smartphone sales data for Q2 2013. The Android platform now drives nearly 80% of quarterly smartphone sales across the globe, while the iPhone's share fell to just 14%. While the iPhone's sequential decline was lower than expected, its market share fell because sales of Android smartphones continued to show strong growth. As per Gartner's data, Android smartphone sales have seen consistent QoQ growth (with no sequential declines) since Q1 2009. This shows that dropping ASPs have enabled smartphones to reach many more first time users. The Windows Phone platform overtook Blackberry to become the third largest platform, but that's not really much of an accomplishment given the fact that it still holds just over 3% of the market. The US continues to be the iPhone's strongest market and the weakest market for the Android platform. The market share dynamics in the US are very stable compared to the rest of the world because of the unique pricing model followed by carriers. Interestingly, Windows Phone's market share has declined again after a brief uptick in March & April as promotions slowed down. Platform leadership dynamics have remained stable in the UK, with Android holding a 56% share and the iPhone holding a 30% share. With the launch of cheaper Lumia variants and Lumia 520 promotions, Windows Phone has consistently gained share in the country. Android smartphones have grown to capture nearly 78% of the German market and consequently, the iPhone's market share has dropped below 14%. 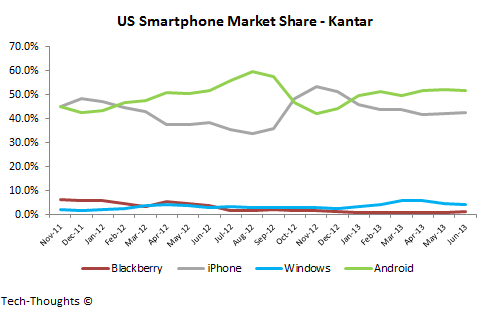 Windows Phone's market share had seen strong growth early in the year, but has now flat-lined and dropped below 6%. This decline comes at an interesting time as it is follows the launch of Nokia's volume-driver, the Lumia 520. 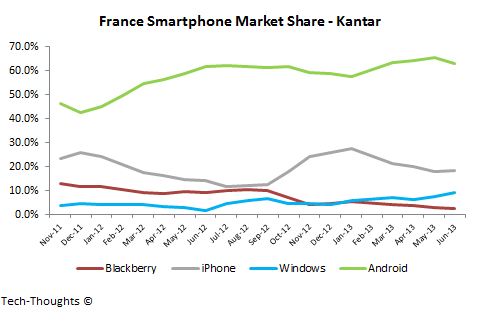 The French smartphone market saw Android market share drop below 63%. The iPhone saw a decline as well but recovered later in the quarter to end up at 18%. Windows Phone was the primary beneficiary of these declines, as it grew its share to 9%. Italy: Windows Phone's Limited Staying Power? 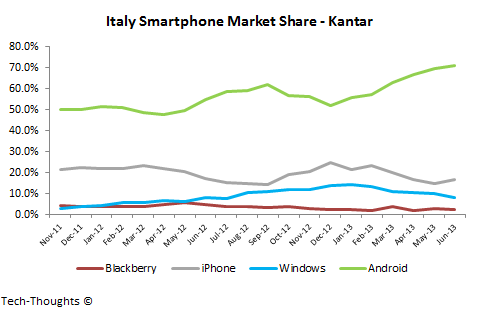 The Italian market was favorable for the Android platform, as its market share grew sharply to breach 70%. The iPhone survived a mid-Quarter slump to end up at roughly 16%, while Windows Phone continued to decline and dropped below 8%. Interestingly, Italy was the most significant EU5 region for Windows Phone devices early in the year, when they held a 14% share. The steep decline since then is interesting and we will need to keep a close watch on the sustainability of their gains in other regions. 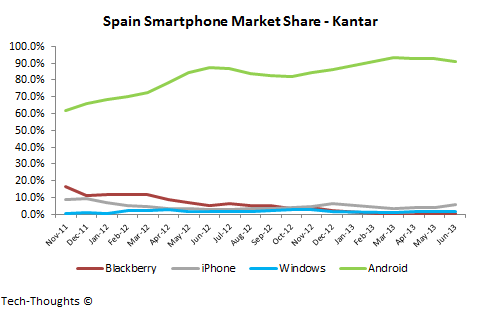 Spain has been one of the strongest markets for Android smartphones in the EU5 region. Driven by price-sensitive consumers, the Android platform accounts for well over 90% of smartphones sold in the country. However, in Q2, the Android platform lost a few percentage points, while the iPhone increased its share above 5%. This dynamic could have been caused by pricing promotions on the iPhone 4. Interestingly, while Nokia/Windows Phone execs claim that their performance in price sensitive (unsubsidized) markets is strong, they are nowhere to be found in Spain. 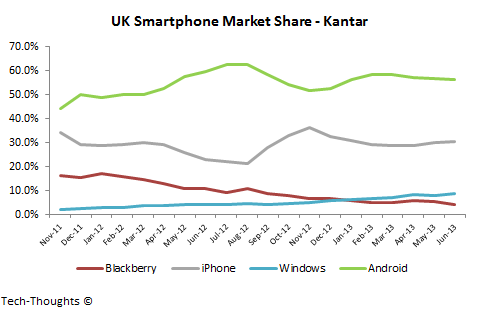 In fact, Windows Phone has actually lost market share over the last few months. Android maintained leadership position in the EU5 region (incl. 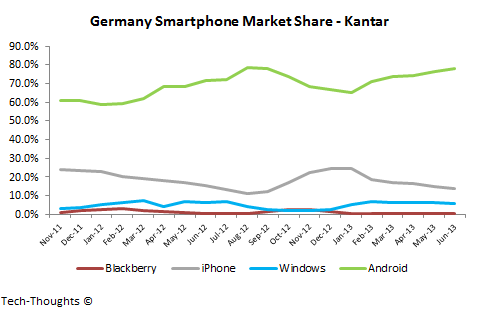 UK, Germany, France, Spain & Italy) with approximately 70% market share, while the iPhone maintained an 18% share. 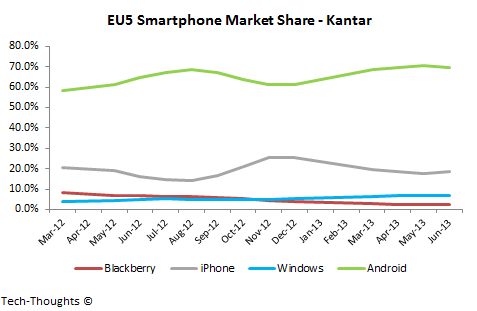 Windows Phone's market share had seen strong growth in the EU5 this year, but had slowed considerably by June. Interestingly, while Windows Phone's overall position is stable, its performance within individual EU5 countries is remarkably inconsistent. It's a possibility that Windows Phone's gains in certain regions may have been caused by pricing promotions (specifically related to the Lumia 520) and may not be sustainable in the long run. 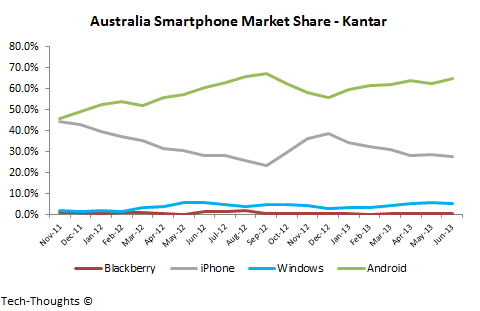 The Australian smartphone market shows the most cyclical market share patterns after the US & UK, i.e. it is one of the most "iPhone-launch-sensitive" regions in the world. Heading into launch season, Android's market share rose to nearly 65%, while the iPhone's market share dropped below 28%. Windows Phone saw strong growth until April, but has since flat-lined at around 5%. In Urban China, Android's market share dipped below 68%, while the iPhone was roughly flat at 25%. This is interesting because Apple reported a steep decline in Greater China sales (includes Hong Kong & Taiwan). This suggests that a significant portion of iPhone sales in Greater China are not from Chinese carriers, but from Hong Kong. Windows Phone's performance was strong, as it jumped up from 2% in March to nearly 5% in June. I'm very interested in gauging the long-term sustainability of this trend given the fact that it was likely caused by promotional pricing on the Lumia 520.